Business description - Latteys Industries is in the business of manufacturing of pumping solutions for homes, agriculture & industrial sectors. Pumps include Submersible, Self-Priming, Centrifugal, Shallow and Horizontal Pumps. The company manufactures more than 700 models of pumps as its portfolio. These pumps are widely used by domestic and industrial sectors. The pumps are manufactured and sold wholly in India. The Company started manufacturing in year 2004 in Chatraal, Gujarat and moved to a strategic location of GIDC Naroda, Gujarat with an area of 5,718 sq. meters in the year 2011. The Company currently has an installed production capacity of 1,59,500 pumps p.a. The company manufactures pumps of various sizes, structures, technicalities which forms the deciding factor for the uses and pricing of the product. Various raw materials like EC Grade, winding wire and cable, stainless steel pipe, electrical sheet stamping, etc. are procured from various industries from domestic market. Its customers are mostly dealers and direct users. 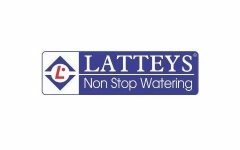 Latteys Industries IPO allotment status is now available on Link Intime's website. Click on this link to get allotment status.